Cosmetic Modification (Interior/Exterior/Lighting) Discussions about cosmetic mods. I don't think I read this yet, but Flossy has the lockout for the STi, but have any of you installed it on your FR-S? I've got the flossy as well. Love it. You need to be VERY specific with him that you need it with the nut to center it and that it needs to be countersunk for a reverse lockout.. LOVE mine, but I am well aware of the customer service horror stories. I've actually met the guy and he's super cool, just really busy and a little forgetful, but aren't we all. ^I actually couldn't use the provided but with mine. Still wouldn't center up. Ended up using some blue Loctite on the shift lever and let it set overnight. Works perfect and keeps it in place. And if you ever have to take it off it comes off fairly easy. This is mine, custom made from solid 7075 aluminum with black anodize. After work on a hot/sunny day its real hot, but I prefer the look and feel of this over stock. Perrin fat knob with a custom 86 logo. Did you make the 86 badge? If not, where did you buy it? Hm. is that F-Sport logo on the surface or underneath the clear coat? I really like the look of the knob but I'd want to get rid of that. Thanks for the advice. I think I've had enough conversations with him for him to keep everything in mind. LOL! I just hope the grip tape version of the lockout works on the FR-S.
My wife got me the Redhead Shorty from Flossy for my 04 STi and it fit perfect on my 86. Thanks, I know the knobs will fit, just worried about flossy's lockout working on the 86. 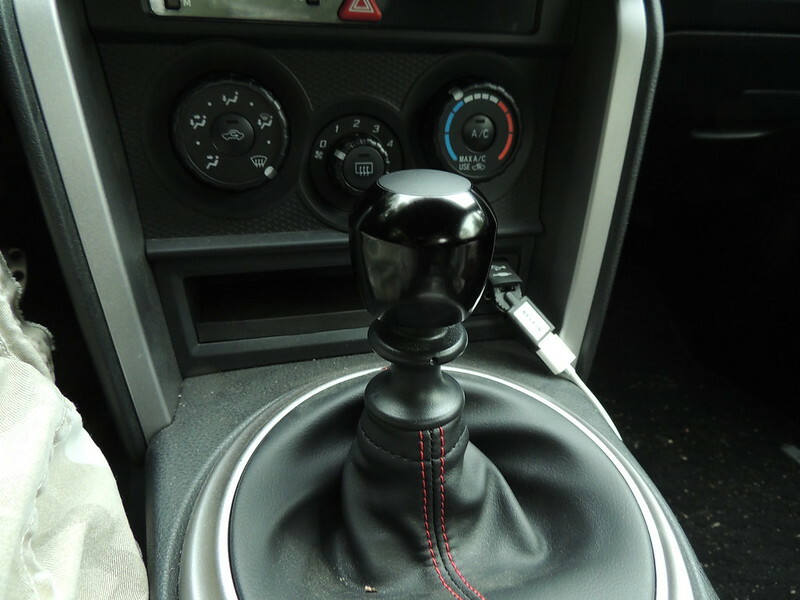 I just hope the grip tape version of the lockout works on the FR-S.
Can anyone recommend me a shift knob for a 6MT? I don't want it to be much heavier than stock, preferably the same weight. I was thinking of the Perrin fatty. I had the Flossy griptape shift knob and I bet no one here will agree with me until they put themselves in the same situation. I drove a friends BRZ with a stock shift knob which made me realize my flossy knob with pentosin trans fluid and perrin shift bushing made my trans feel like it had no fluid in it at all in comparison. I switched back to stock and it's infinitely smoother and more enjoyable to drive. Odd. I got exactly the opposite experience. Shifting was MUCH improved and smoother with the flossy. I agree, at first I thought it was fantastic. It wasn't till I drove a car with a stock shift knob that I realized the flossy wasn't for me. I ended up selling it after using it for a year. I would never go back. Anyone have any problems with their aftermarket knobs coming loose while driving? I've had this happen with a couple aftermarket knobs including my current Flossy. Anyone try some loctite or something to keep it still? Use some medium (blue) Loctite. Couple dabs on the threads of your shifter and you're good. I did mine right before I turned in for the night and it was good to go.